OnBoard New York Tours takes its customers aboard the Staten Island Ferry (free of charge) to see remarkable close up views of the Statue of Liberty on the NY See It All! Tour. Our Tour Guides will board the Staten Island Ferry with you to provide a historical narrative of the landmark. Currently, we do not recommend going to the Statue of Liberty until the crown is reopened for passenger access and viewing. The current airport-like security line is very long and can take up to 90 minutes before you board the ferry to go to Liberty Island. The Staten Island ferry takes only one hour to complete and there is always plenty of room. Nevertheless, if you would still like to go to the Statue of Liberty aboard the Liberty Ferry, we really recommend you do that on a different day than the day of your OnBoard Tour. You can purchase your tickets for the Statue of Liberty Ferry to go to Liberty Island through OnBoard Tours. Call us at 1-877-U-TOUR-NY or 1-212-277-8018 to book your tickets. Located on Liberty Island in New York Harbor, the Statue of Liberty was a gift from the people of France to the people of the United States and is one of the most universal symbols of freedom in the world. The Statue of Liberty was dedicated on October 28, 1886 and was designated a National Monument on October 15, 1924. The Statue was extensively restored in time for her one-hundred year anniversary on July 4, 1986. 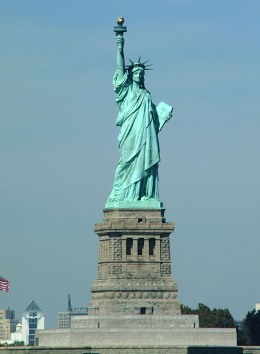 The Statue of Liberty is the most visited tourist attraction in New York City. It is also the 2nd most photographed landmark in the United States behind the Golden Gate Bridge in San Francisco. Many of our customers ask if they can go up the Statue to the crown or the torch. The crown has just been reopened, but the torch remains closed. In fact, the torch was closed in 1916 due to structural issues that arose after a bomb went off at nearby Black Tom Wharf during World War I. Tourists may climb to the top of the pedestal and enjoy the view from there. With this in mind, it makes one wonder why go to Liberty Island at all? OnBoard Tours provides its guests with unbelievable close-up views and photo opportunities of the Statue, in one-fourth the time.